UDM Downloads > LeaderTask PDA Organizer! 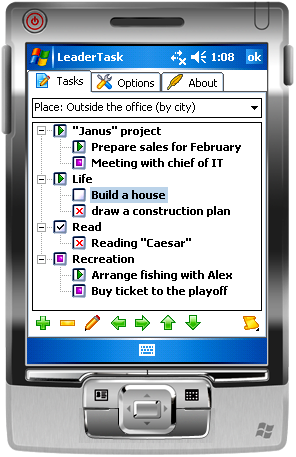 PDA organizer for pocket PC to organize tasks and shopping lists in a treelike structure. Quick task adding and reliability are the main features of this easy-to-use software. It is fully synchronized with LeaderTask Personal Organizer. LeaderTask PDA Organizer is a mobile version of LeaderTask for Windows Mobile. With LeaderTask PDA Organizer, you will no longer need your paper notes: "To Buy" or "To Do at Work/ the Bank/Tax Inspectorate/ on My Way Home." You will always have the needed information at hand wherever you need it, because LeaderTask PDA Organizer will always be with you on your pocket computer. Features: * Task groups by category. It is convenient to sort the tasks to thematic groups: "To Buy", "At the Bank", "At the Tax Inspectorate", "At Work"... * Treelike task organization. Tasks can have an unlimited number of subtasks and levels. This feature makes it easy to split up a main goal into smaller tasks. * One-click offlisting. When the task is complete click its status to take the task off the list. * Unlimited number of tasks and categories. The number is limited to the memory capacity of your computer. * Task status. Tasks can be assigned the status of "Done", "In Progress", "Stopped", "Cancelled", "Not Started". * Full mutual synchronization with Leadertask Personal Organizer. Requirements: Installed ActiveSync for synchronization with Windows Mobile. Supported Operating Systems: Microsoft Pocket PC 2003/2003SE/WM5.x/WM6.x.